I have a serious craving for chicken. And garlic. Chicken and garlic. So, to satisfy my craving, I will be doing some herb-crusted chicken tonight with baked sweet potato and steamed carrots on the side. Simple enough meal, right? The challenge, and one I’m excited about, is to put together the herb-crust for the chicken without using any grains. I think I’m up for it! First preheat the oven to 425. As the oven heats up, prepare the chicken. Combine the almond meal, coconut chips, chopped garlic, and seasonings in a large mixing bowl, and mix thoroughly. Now take the chicken and rub coconut oil onto the skin of the chicken, then put the chicken in the mixing bowl and coat the chicken liberally with the contents. Place the chicken in a coated baking pan, and as soon as the oven is heated, put the chicken in the oven. Set the timer to 45 minutes. As soon as the chicken is in the oven, add the sweet potato. Lightly coat the sweep potatoes with coconut oil, then wrap the sweet potatoes individually in aluminum foil. Get these in the oven as quickly as you can, as they take almost as long to cook as the chicken. Now you have some leisure time. Ideally, it shouldn’t have taken you more than about 2 minutes to get the potatoes in the oven, so you’ve got more than 30 minutes before you need to steam the carrots. Enjoy your leisure time, but don’t lose track of the clock! About 10 minutes before the chicken is done, cut and steam the carrots. I like to make longer cuts on the carrots, because I like my steamed carrots to be 2-bite sized. Plate the sweet potato first. I will be using large sweet potatoes, so they are much larger than 1 portion. So in plating, I have to both unwrap them, and cut them to size before serving. I will be plating the carrots next, and the chicken last. And enjoy! I hope you get a chance to try this tonight; and let me know how you like it in the comments section! Gonna make this Sunday. What wine would you pair it with? Awesome! Also, I like to make more than I’m going to eat in a meal, and use it for breakfast/lunch the next day. Chicken can be chopped and added to a frittata, made in to a soup, or just re-heated for a second meal! 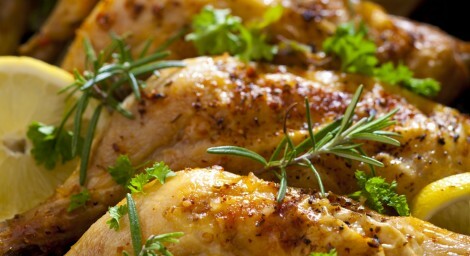 Wine: Typically, when I think about chicken, I think about white wines. I would guess that the best white for this meal would be a bottle of the Bogle Chardonnay; it’s quite tasty, and a really good price. It’s one of my go-to wines for chicken or shrimp. Alternatively, whenever I am looking for a good bottle of red or white, I generally check on here for advice and pricing: http://www.markoldman.com/marks_picks The November Spanish wine looks like it would be a winner with this meal too. Ok man. Cooked this after church and it was amazing. Your directions were spot on. We enjoyed every last bite. Still say you have a paleo cookbook in your future. Awesome!! I am so glad you loved it!!!! And I’m really excited that you think there’s a cook book in my future!